Recently, I was very excited to discover that one of the farmers at our local market started carrying grass-fed ground beef. My family is not a big meat-eating one, but whenever I can get my hands on grass-fed beef at a good price, I don't hesitate to buy some. Among other things, grass-fed beef is significantly lower in saturated fat than conventional beef, as this 2006 article from Time Magazine states and I personally think it tastes superior. Tacos are great idea to use ground beef in, but depending on your taste or diet, you can use any kind of ground meat. Gimme Lean is great for vegetarians or you can use ground chicken or turkey. The point is, no matter what you like, you can make Tacos--Your Way! When I put out all the accompaniments for my boys to create their tacos, they were totally psyched. When kids (and dads) get to have an active hand in building their own tacos, I guarantee they'll be way more excited about eating them too. 1. Heat the oil in a large saute pan over medium heat and cook the onions for 2 minutes. 2. Add the red bell pepper and cook for another 2 minutes. 3. Add the ground meat, garlic, cumin, chili powder and salt and cook for 5-6 minutes or until meat is cooked through. 4. 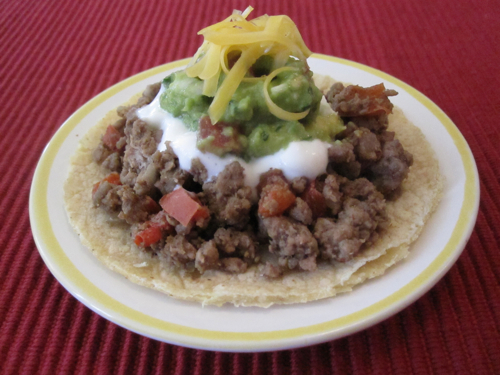 Place meat mixture and desired accompaniments into taco shells or tortillas.